⭐ Leather sole+ Breathable PU upper; Easy to clean with wet dishcloth. ⭐ Feature: 3D embroidery in PU upper is so cute for our little children,pefect for for dancing, gymnastics,party and wedding. 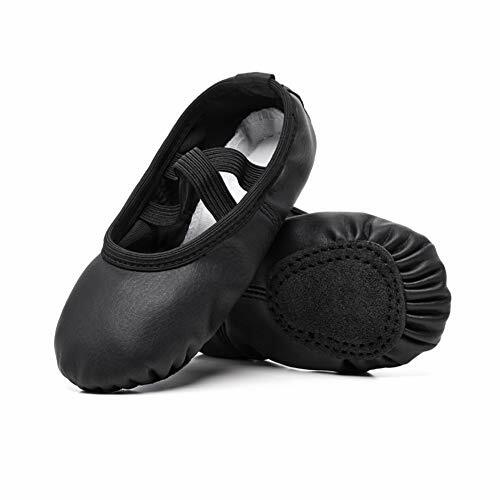 ⭐ Premium Material:Professional Soft Ballet Shoes With breathable Pu, light weight you feel flexible and comfortable when you dancing. Leather Sole Wear Resistant, Waterproof, Skid Resistant To Prevent Wrestling. ⭐ Size Choice:Refer to the shoe size chart in images for proper sizing. Dance shoes are supposed to fit close to the foot, they aren't supposed to fit like regular street shoes, Please Measure Your children's Foot Length For Safety And Get the best Fit. For kids younger than 5 years old, please order Toddler 5M-Toddler 10M;For kids between 5 and 10 year old, please order Little Kid 11M-Little Kid 3M. Boys need order one size up. ⭐ Customer Support: We offer 24 hr/ 7 Days' on-line customer support. If you got any question please contact us at the first time.